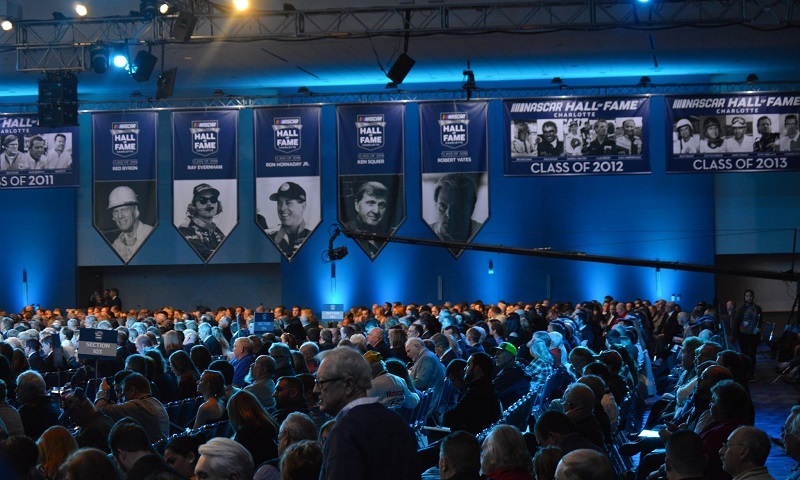 DAYTONA BEACH, Fla. – Five NASCAR icons – two drivers, a crew chief/owner, an engine builder/owner and a broadcaster – were enshrined into the NASCAR Hall of Fame in Charlotte, N.C. on Friday night during the Hall’s 2018 induction ceremony. Honored inside in the Crown Ballroom at the Charlotte Convention Center, Red Byron, Ray Evernham, Ron Hornaday Jr., Ken Squier and Robert Yates made up the ninth class of the Hall of Fame, which now holds 45 inductees. A pioneer of the sport, Byron won the first NASCAR race at the Daytona Beach Road Course in 1948. That year, he went on to win NASCAR’s first season championship in the NASCAR Modified division. The next season, Byron won NASCAR’s first Strictly Stock title – the precursor to today’s Monster Energy NASCAR Cup Series. Byron achieved these feats despite having to drive with a special brace for his left leg, which he injured serving in the Air Force during World War II. In the 1990s, Evernham paired with Jeff Gordon to rewrite the NASCAR record books. Evernham guided Gordon to three championships in four seasons (1995, ’97, ’98). The pair collected a series-high 47 wins in the 1990s, taking the checkered flag in two Daytona 500s (1997, ’99). A skilled innovator, Evernham’s ‘Rainbow Warriors’ pit crew revolutionized the modern pit stop. He won 13 times as an owner and led the return of Dodge back to NASCAR in the 2000s. Hornaday is statistically the greatest driver in NASCAR Camping World Truck Series history. The Californian boasts a record four Truck Series championships and won 51 races. He also tops the series annals with 158 top-five finishes. In 2009, Hornaday won five straight races, a feat matched by only two other drivers in NASCAR national series history. “This is for every short track racer that ever had a dream, ever had a heart, ever believed in anything that you can believe in, this is it … the Hall of Fame,” Hornaday said.